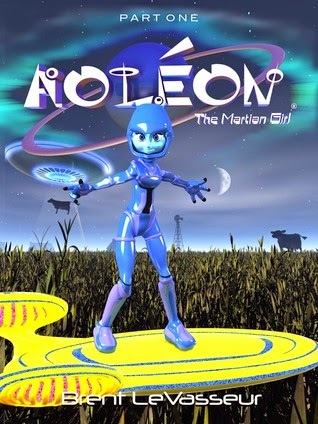 Aoleon The Martian Girl: Science Fiction Saga - Part 1 First Contact by Brent LeVasseur is available at Amazon. Join Gilbert and Aoleon in this exciting middle-grade science fiction and fantasy adventure! This story utilizes pop-nerddom knowledge. Nerdy kids will enjoy recognizing the references. But the story is shorter than you think because (1), this is the beginning of one story broken into several individual parts (the end is abrupt) and (2), there's a lot of illustrations. The illustrations aren't cohesive in style/format but they contain some of that pop-nerddom I mentioned earlier (I'm fairly certain that one illustration was crafted using The Sims characters). And many of the illustrations made me think of children's TV and movies. I wish the prose had matched the illustrations by being more reminiscent of a screen-play. Losing the passive third person omniscient narration that tells more than it shows would tighten the story-telling into something reminiscent of a Disney-Pixar film. However, the nerds that this book will appeal to are the ones who will be the most forgiving to the prose. Partly because of all those pop-nerddom references that keep popping up.